Contest Giveaway: Flight of Finishing Salts! 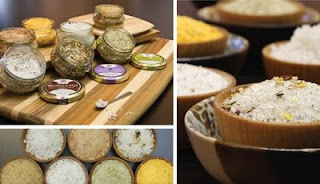 Marx Foods just recently added Ritrovo’s Fine Finishing Salts Collection to their webstore and are really excited about these exceptional artisanal salt blends. Truffle & Salt: A blend of dried Italian black truffle and sea salt, this flavor combination will enhance any dish with the aroma and flavor of Italian truffles including popcorn, mashed potatoes, pasta dishes, scrambled eggs and roasted meats. Fiori & Salt: An aromatic blend of Italian sea salt and flowers including chamomile, poppy, mallow, marigold, lime, hawthorn, yarrow, wild orange peel, flower pollen, heather and lavender. This combination is a wonderful way to infuse olive oils, sprinkle over fresh mozzarella, finish cream soups and risotto or bake into breads. Fennel &Salt: A combination of sea salt, fennel seed and orange peel this blend pairs well with sweet and savory dishes including wild salmon, goat cheese, chocolate truffles or caramel. Sweet & Salt: A sweet and savory blend of Italian sea salt, dried & ground fruit, sweet spices, vanilla, chocolate and grape must, this combination pairs well with both aromatic and dessert dishes. Sweet & salt can be used as a rub for duck or pork, sprinkled on roasted squash, pumpkin soup, or buttery shortbread cookies. Saffron & Salt: Red strands of saffron are blended with sea salt resulting in a flavor profile that is perfect for finishing paella, cioppino, pasta or fresh ricotta. Sea & Salt: A combination of high-quality Sicilian bottarga, citrus, sun-dried tomato, and cardamom, this blend is ideal with pasta, steamed vegetables or used to cure seafood and enhance salad dressings. Limited Edition Cervia Salt: From Cervia salt pans, this Italian moist fleur de sel is the crème de la crème of sea salts. With a light texture and rich flavor this salt can be used to finish meat, poultry and fruit dishes as well as sweets including white chocolate chip cookies and caramel chocolate combinations. Cool--thanks very much for the tip! BTW, I've been following you in my reader for a while (we Chicago bloggers gotta stick together!) but just popped into the actual site now. Like the new look!